I was planning on making the dress, adding piping to the neck and sleeve edges, and lining the skirt (oh, and adding pockets of course). I got all the way to the neck, and tried it on, and realized that I hadn't taken the advice of all the sewist reviewers on Pattern Review -- I'd forgotten to cut the neckline larger. Argh! I was strangulating in it! The thought of unpicking the facing AND the piping, resizing the neckline, recutting the facings and resewing it all was overwhelming. I put it aside for what turned into a couple of weeks. Sounds like you've recovered well and are back on your way! I'm sure your dress will be lovely and worth all your effort. 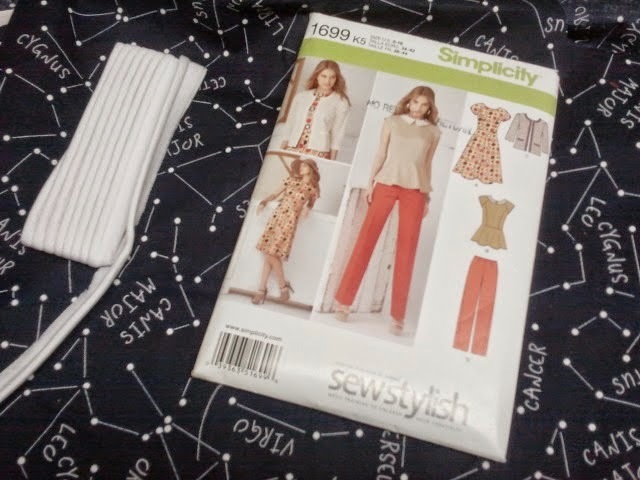 Thank you -- I have to finish it, as the skirt has worked perfectly and I love the fabric! I left you a comment on MAGAM. Sorry to hear that you had problems. I made the top for my Daughter in law and it was fine and made the top and dress for myself. Hope you will be able to make it again without problems. I hope so too! Good to hear that you made it without problems -- it gives me hope that I can actually recover this one and try again, as well. Oh, what a hassle. Two in a row - not a good fun. I'm glad you are slowly getting things sorted out. Yes, two in a row is a bit much! I want to get the dress sorted as I love the fabric so much...good thing there are a couple of days off this week to work on it! Yes, it seems sometimes I"m "on" and sometimes I'm just not.... seem to be getting back in the sewing swing though, thankfully! I always end up altering my necklines, I strangle easily too! Hope you return to that dress- Ill bet that fabric is adorable!